Though listed as a mystery, The Shades by Evgenia Citkowitz is a challenging novel to classify. Citkowitz calls her writing “mysterious,” and that may be the better descriptor for her genre. Perhaps what Citkowitz has written is a ghost story for the new millennium. 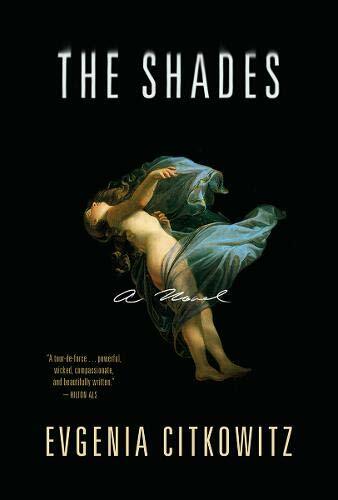 A postmodern, gothic novel, The Shades brings to mind du Maurier’s Rebecca in its tone and style. Citkowitz’s ghosts are the electronic footprints left behind by the recently deceased. Like spectres from classic stories, these modern-day equivalents haunt the survivors through saved texts, emails, and photographs. When 16-year-old Rachel texts her father asking permission to stay overnight with a friend, he responds with his most common refrain, “Ask your mother.” That night Rachel dies in a car crash, and “ask your mother” takes on far greater significance than simple permission for a sleepover. As in any good gothic tale, after Rachel’s death, Michael and Catherine, along with their surviving son, Rowan, must either move forward or go mad. The novel revolves around their attempts to adapt to their new lives as a trio instead of a quartet. Adaptation often requires painful change. The strength of The Shades is the interweaving of these three characters and their individual reactions to a shared tragedy. Citkowitz slips between characters in a dreamlike state. Her language echoes literary authors of the past, as does one of her primary settings, a rambling house in the English countryside—broken into apartments—that Michael and Catherine share with virtual strangers. Catherine hides in their portion of the isolated mansion. Michael remains in their London home, while 16-year-old Rowan, “the Irish twin,” removes himself to continue his education at boarding school. Each of the three main characters inhabits not just a different emotional space after the tragedy, but also a separate geography. Catherine and Michael struggle to bridge the widening gap that always existed in their marriage. Michael knew early on there was “a remoteness that created a space between them that he never understood,” but they married anyway and that action sets the events of the novel into motion. Fate plays a role, as the tragedy of the novel feels preordained early on in their relationship. For Catherine and Michael’s third date, they went to an opera of Orpheus’ journey. In discussing Orpheus’ failure to save Eurydice from the underworld, Catherine expresses her emotional reaction, “‘[i]t isn’t about whether he was successful in bringing her back . . . it’s that he went to get her at all.’” At the time, Michael finds this response “as good a definition of love as any.” A reaction he should have paid closer attention to at the time. After Rachel’s death, like Orpheus, Michael is faced with his wife’s descent into a psychological underworld as she struggles to survive the loss of their child. The novel tracks her journey and Michael’s decision whether or not to attempt to cross the river Styx to rescue her, or leave the marriage and save himself. Meanwhile, Rowan is left to his own devices to find a way out of the darkness. While not a mystery per se, there is a question to be answered. A stranger from the mansion’s past visits Catherine, a young woman who needs help. Her vulnerability temporarily reaching through Catherine’s grief, though the reader must wonder if the young woman will become a lifeline or an anchor. The concept of repetition continues throughout the novel, considering all the different permutations of what could have been done differently by parent or sibling that would have stopped Rachel from getting into the car on that fateful night. Guilt and grief intermingle as her parents and brother analyze Rachel’s final days. They all remember different aspects of her, giving the reader a fuller picture of Rachel than any one individual characters has. The ending of the novel is murky and those who require a neat final moment may be disappointed. It does, however, come full circle and revisit, from a new perspective, the awful event that Catherine witnesses. It’s then left to each reader to determine the answer to the question of the mysterious young woman. Readers may interpret the ending differently based on personal experiences, bringing them into the same situation the characters find themselves: How do you understand the world now?